The Thanksgiving weekend gave stores a lot of shopping to be thankful for, especially Cyber Monday, which surpassed all sales expectations. Cyber Monday is known as the biggest day of the year for Internet shopping and this year was no exception, with online sales hitting a record high of $3.39 billion as online shoppers searched for special deals. Fortune.com reported on the reasons why Cyber Monday held a cornucopia of sales for post-Thanksgiving shoppers. The retailers that saw the highest sales over the Thanksgiving weekend were Walmart, Target, Amazon, Best Buy, and bby. Most consumers were spending on high-ticket or high-tech items like ultra-HD TVs and video gaming consoles. While Cyber Monday sales exceeded expectations, Adobe reported that the rate of growth on Cyber Monday was lower than on Black Friday, which saw a 21.6% growth rate. This was attributed to a lower sales base than the prior year. Another factor was that Cyber Monday featured fewer deals than Black Friday, according to e-commerce analytics firm Clavis Insight. Brick-and-mortar stores decreased the amount of deals by up to 4%. Some e-commerce retailers believed that the increase in online sales over the post-Thanksgiving weekend was due to the consumer’s return to shopping after focusing on the recent presidential election. 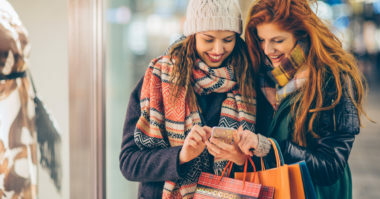 By the holidays, consumers were able to focus their attention on shopping. But the National Retail Federation (NRF) reported that while consumer spending was strong, it declined about 3.5% over the Thanksgiving weekend due to the belief that deals would be available throughout the season. But for the remainder of the holiday shopping season, the NRF has forecast that total retail sales should increase around 3.6% based on high job and wage growth. See what’s in store for retail marketing. Contact MDG Advertising.